Other ingredients: Maltodextrin, Fructose, Stearic Acid, Croscarmellose Sodium, Magnesium Stearate, Silicon Dioxide, Cherry Flavor. Suggested Use: 1 tablet daily or as directed by a health care professional. For best results allow to dissolve slowly under the tongue. Accordingly, we will limit our discussion of methylcobalamin to a brief summary of relevant research, and let you draw your own conclusions about what medical conditions it may be effective in treating. Diabetes afflicts animals as well as humans, so it’s not surprising that pets can also suffer from diabetic neuropathy and that Zobaline the cat-specific form of Xobaline is being used as a treatment. This subject is discussed in a separate article on this website. 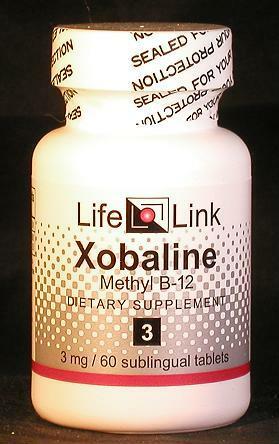 Are methylcobalamin supplements useful for the conditions and purposes mentioned above? We aren’t allowed to tell you, so you should take a look at some of the references cited here, and then decide for yourself.